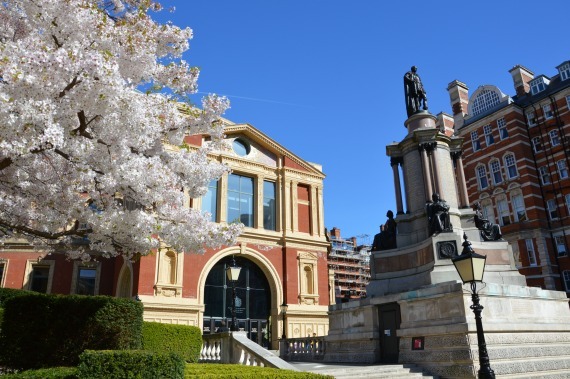 The Royal Albert Hall looking lovely for spring! London really is a city of trees, with about as many trees as residents. And that’s no small number! (Although I do wonder who counted all those trees …) One of the joys of springtime in London is seeing all the blossoms – everywhere! This is the time to get out in the parks, like Kensington Gardens, to enjoy the colours and scents of the spring. But you’ll find signs of spring while simply strolling through the neighbourhoods. 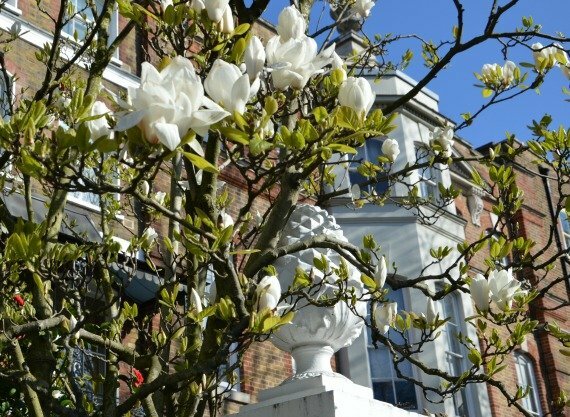 Here’s a look at some of the spring flowers and blossoms we’ve captured this year in Chelsea, South Kensington, Kensington and Mayfair. I think this pretty tree above that I spotted in Chelsea is a pink camellia. Whatever it is, I could have stood under it for far longer than I did. Love those brick walls and white-framed windows as the backdrop – so very Chelsea! Classic red brick buildings of Chelsea! 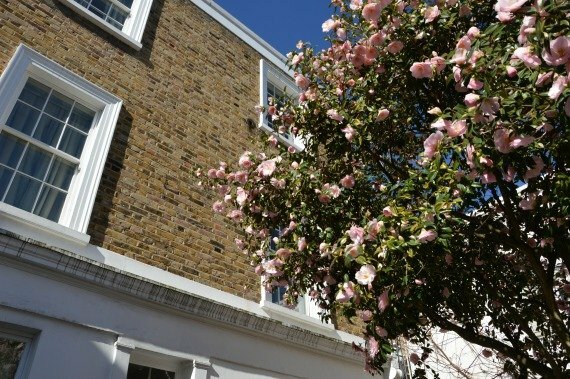 Chelsea is one of my favourite urban spots to wander on a pretty spring day in London. The architecture is so varied and colourful and the streets very quiet and beautiful. 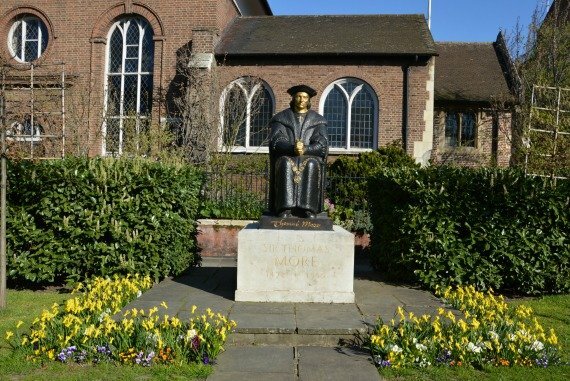 I walked all the way from King’s Road down to the Chelsea Embankment and stopped at the statue of Sir Thomas More at the Chelsea Old Church. 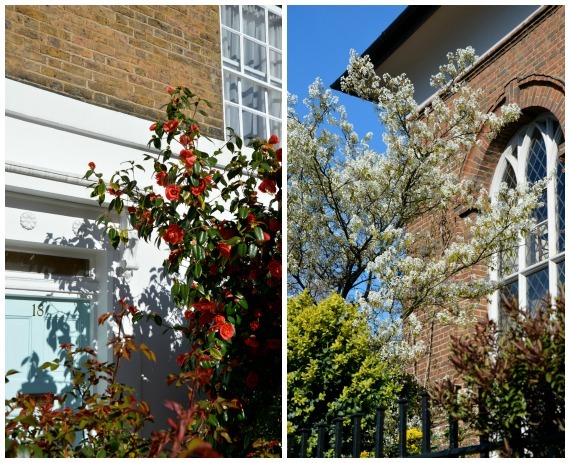 Around every corner there were more beautiful spring scenes with the colours of the flowers and blossoms perfectly complementing the architecture of Chelsea. It’s easy to see why this is one of the most popular neighbourhoods in London for Londoners. 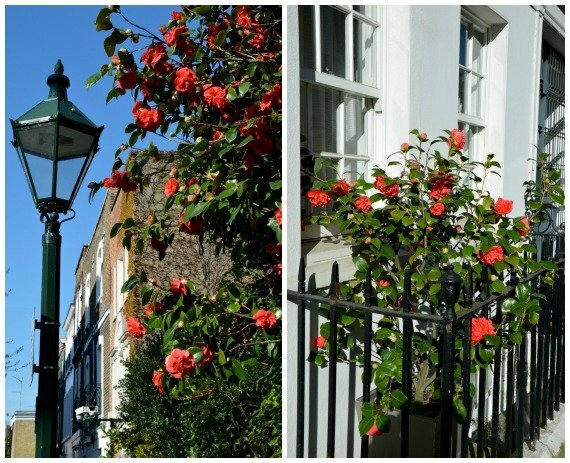 Blossoms and flowers of all colours around Chelsea! While in Chelsea, take time to meander through the streets where famous artists and writers once lived. Today I always wonder about the Londoners and families that call these lovely properties home. 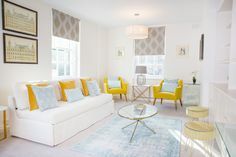 You’ll get to experience all the charms of living in one of London’s most sought-after neighbourhoods during your stay in a vacation rental in Chelsea! I love seeing how Londoners create such pretty gardens in limited space. Maybe it’s just a few little bushes and some spring flowers or a rose bush or tree. But they create these marvelous gardens and green spaces just outside their front doors. 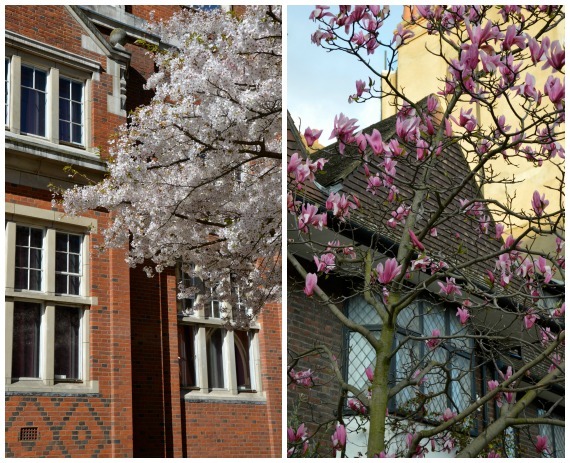 London’s architectural beauty and spring blossoms! Then be sure to walk through Kensington and South Kensington in London where you’ll find different styles of architecture, with grander streets and taller buildings. 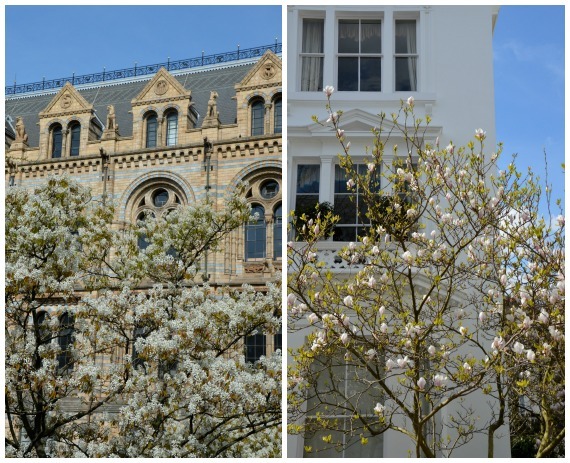 The blossoms on the trees in front of the Natural History Museum in South Kensington are always a favourite spring stop for me, because I love the polychromy of the building designed by Alfred Waterhouse and the enthusiasm of the schools of children waiting to go inside to see the dinosaurs and other intriguing displays. But there are plenty of flowers around London to enjoy the colours while on holiday. 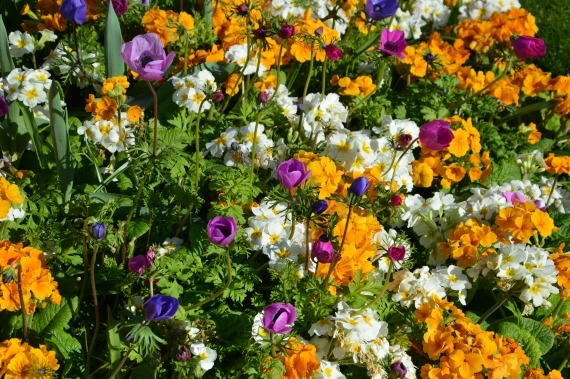 In the springtime, take a stroll along the Chelsea Embankment by the Thames where I found the gorgeous flower bed below. Or even while shopping … an irresistible pastime in London! If you’re walking down busy Oxford Street, take a quieter moment to walk down St. Christopher’s Place (between James Street and Marylebone Lane on the north side of Oxford Street) where you’ll find a great selection of shops and restaurants. 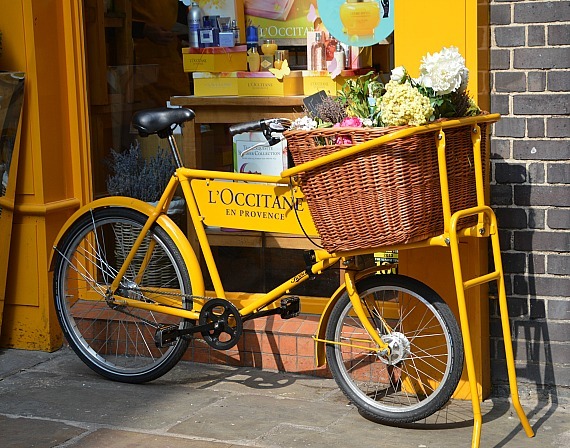 L’Occitane on St. Christopher’s Place was looking particularly springlike! 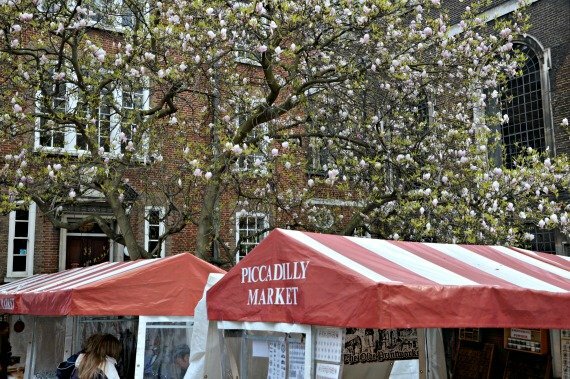 The Piccadilly Market is always a fun stop off while strolling along Piccadilly in Mayfair. The arts and crafts and handmade products on display are completely different from the designer stores along Old Bond Street nearby, but I love that contrast while shopping in London. 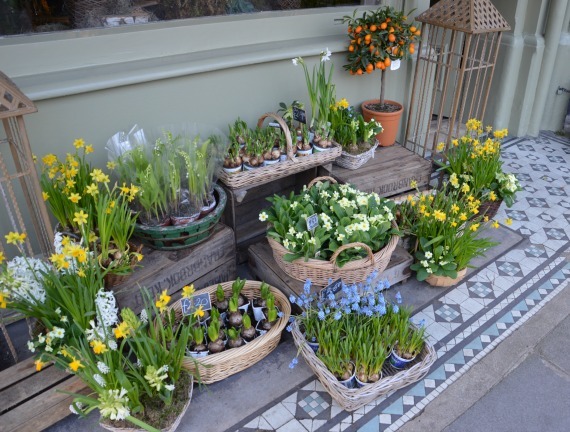 Have you been enjoying spring in London this year? We’d love to see your photos, too! 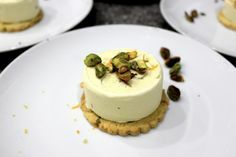 Please do share them with us on our London Perfect Facebook page. 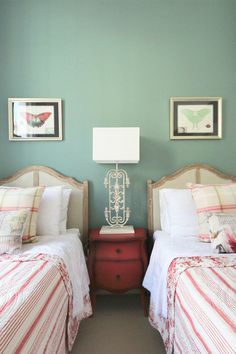 Posted on Tuesday, April 22nd, 2014 at 1:07 pm in London Living. You can follow any responses to this entry through the RSS 2.0 feed. You can leave a response, or trackback from your own site.